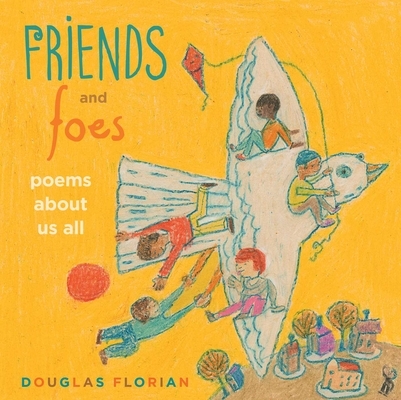 In the tradition of Shel Silverstein, celebrated picture book poet Douglas Florian offers an honest, touching, and often humorous collection of twenty-three poems about relationships—both good and bad! There are all kinds of friends—good friends, bad friends, old friends, new friends…even imaginary friends! This humorous, heartfelt, and refreshingly honest collection of poems explores the many facets of friendship with Douglas Florian’s signature sense of silliness and wit. This collection of twenty-five poems teases out many of friendship’s fundamentals, as well as its more nuanced complexities. Along with jealousy, bullies, and new and imaginary friends, the punchy rhymes tackle topics such as betrayal, a friend moving away, and two friends growing apart. “We used to be friends. / We drifted away. / Will we get back together? / Well, maybe someday.” The coloredpencil and crayon illustrations on manila paper help keep the mood bright, but also appropriately imperfect and rough. While the poetry vacillates from serious to silly, the tone remains comforting and affirming throughout. A couple of the poems are written explicitly for two voices to read together, but many are well suited for self-reflection. Those exploring the verses will likely recognize aspects of their own friendship dynamics and may find needed humor and also some solace in their discoveries.